If we study to get just good grades; we may or may not learn. However, if we study to learn; we will always get good grades. The mission of an information security in an organization must be to protect and safeguard the company’s assets like customer information or intellectual properties. Objective of a compliance and risk management in an organization is to measure the success rate of information security team’s mission. If the mission of an information security team becomes to be compliant with regulation and other internal & external governance bodies; the company’s asset may or may not be protected. Have we ever thought about why we go fast (relatively speaking) in a car? Because, we could and the cars are capable of going in high speed; but if you think deep; the reason why we go fast in car is because we have breaks. When we go fast and do not have systematic brakes; then it is called extreme sports. We don’t want to run an established organization as an extreme sport. As an organization; we need to go in high speed but we need to have systematic way of controlling the speed with a proven brake system. Information security, compliance, risk management teams exist in an organization to execute projects & programs faster. There are numerous definitions; perspectives and understanding exist for innovation in market place. It is educational to listen, analyze and understand various school of thoughts on the subject and most of it is useful. My definition on innovation for a profit organization is:“Innovation is a better or new method to bring efficiency or generate revenue”. As always, since Stone Age, innovation is the back bone for future & future economy and this message was echoed by The President of United States, The Prime Minster of India, major management consultants and chief executives of corporate world. In the recent survey conducted by McKinsey, 84% of executives say innovation is extremely important to their companies’ growth strategy. Strong message and emphasis on innovation from senior political leaders, management consultants and top executives motivates citizen of a nation and members of a corporate world to think and work on innovation. But the real challenge being faced by corporate world is lack of executional leadership capacity and refined steps to cultivate innovation. In absence of executional leadership capacity,a structure for innovation within a corporate world, the members who would like to invest their time to be innovative, go down on a path which does not provide fruitful result. Innovation initiatives in an organization without a framework nor a structure is similar to the people who tirelessly worked hard, creative, extremely smart who were passionate to develop a flying machine by watching the behavior of birds. They were successfully able to fell down with wings in terms of flying. In my own experience, I have seen in organizations where innovation program is established by placing suggestion boxes, launching bright idea database and introducing contemporary furnished conference rooms. When an organization is placing suggestion boxes for innovative ideas, the organization culture is too far behind in general communication. The immediate goal and focus of that organization should be to work on basic general organization communication. By just having a bright idea database, the employee who would like to take the organization imperatives and be part of it would come up with ideas which are impossible in reality due legal, regulatory, and compliance reasons. For instance; for an auto finance industry, a bright idea from an employee is to enter mortgage business segment. It is an idea, may be a bright idea but the company may not have license to be in that segment, nor capital to get into that market. Without this key information, employees are going to work very hard and think about the new ideas which are not practically possible to implement. Make it as one of the performance measure of a strategic objective of a strategy map (strategy). Assign this task to an executive leader who has visionary ideas with executional insights – I called it as “executional leadership capacity”. It is challenging to find an executive leader in an organization with this trait. Let the program office develop this framework. 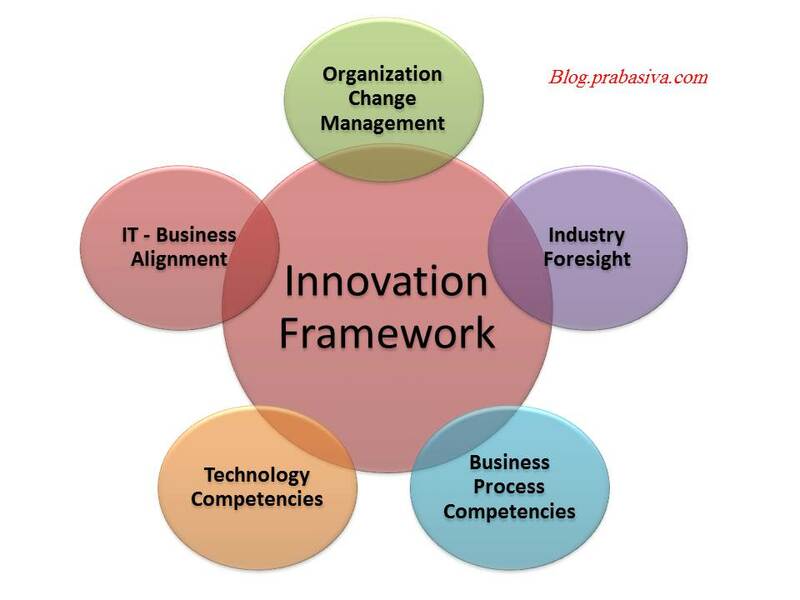 The framework is a tool helps the organization to think outside the box within a business context boundary. There are five components to the framework. They are a) Organization change management: Partner with human resource department. Bring necessary training and coaching to the organization that helps members of the organization to think outside the box. Instill during the training that organization is willing to face both positive and negative consequence of each individual who are thinking outside the box. b) Business-IT alignment: Strong partnership with business team is critical for the innovation program office’s success. To accomplish it, identify partner relationship manager or IT ambassadors for each business unit and develop a sustainable bi-directional communication plan to enable fluid ideas flowing between all teams. c) Industry insights: Partner with the business strategy or business development team. Provide a periodic economical and industry data pertains to the business unit to entire organization. The organization must be aware of whom they are competing in the market, what is the market volume, market segment, how the distribution are spread out, what are the growth opportunities in the competitive landscape and etc. d) Business process competencies: Partner with business process management team or business process operation team or the team who manages the business process for the entire organization. This component of the framework should help the reader of the framework to understand how organization makes money. e) Technology competencies: Identify technologically savvy and curious members in the organization and ask them to study game changing technology trends which are in the pipeline. At this time the game changing technology trends are: big data, mobile computing, social computing and cloud computing. The members must not be nominated by managers, the members of the team must be volunteered who wants to contribute in this domain. The framework is a document that contains all the above components. Make the framework available to the entire organization in all possible media and channels. If the organization management training and coaching technique is effective, organization will seek for the framework and keep it for their reference. It is program office responsibilities to keep the framework up to date and make it available to organization. The framework should also be made available as part of orientation training for new hire for both employee and contractor/consultants. It is the program office responsibility to guide organization to differentiate disruptive & sustained innovation combining with traditional and non-traditional approaches. It is the program office responsibility to measure how program office is performing by measuring number of disruptive & sustained innovative ideas submitted, reviewed, rejected, approved, funded, implemented, benefit realized and etc. It is the program office responsibility to report all program office performance metrics to IT balanced scorecard to provide a holistic view on the organization performance. Big data is the newest buzz w ord in the industry. Executives and information technology experts are all dropped off from cloud computing buzz and hopped into the big data band wagon. Generally, the excitement and buzz in market leads into a misconception of a new idea and takes few iterations before the key concept of new idea is widely understood. Is Big Data a new concept? – No. 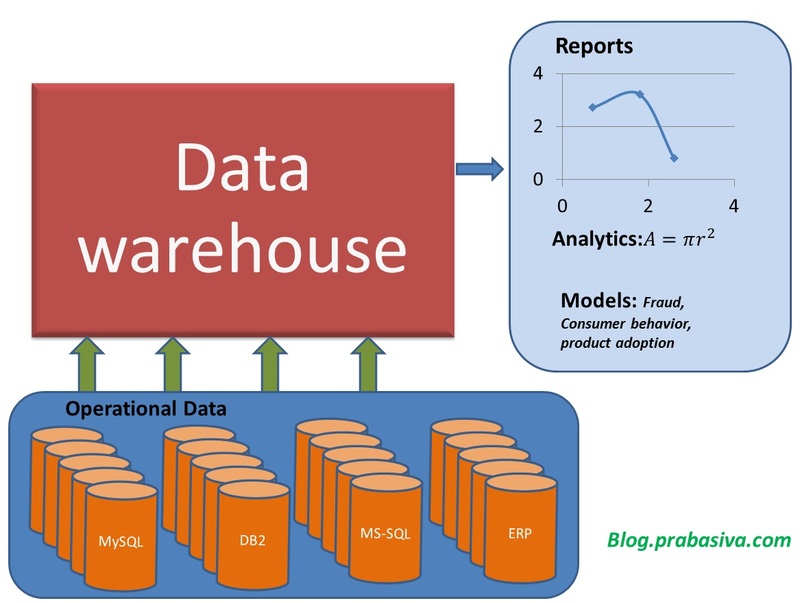 The concept has been there for four decades and it has been named as enterprise data warehouse (EDW) and the focus of EDW is primarily on the internal structured data. 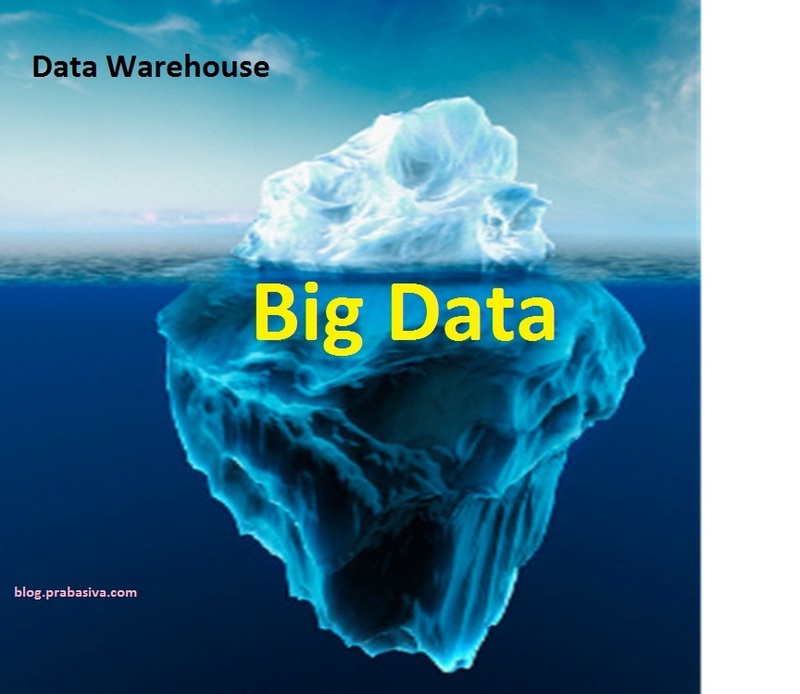 The objective of this blog is to bring the key concept of big data by comparing it with enterprise data warehouse. What is it? – To go back to my last article on Money ball architect, big data is a collection of internal and external information that required for Money Ball architects. Based on my definition, a Money Ball architect (otherwise called data architect or data scientist) shall work to identify a set of differentiating data from a m assive data set. Differentiating data will be modeled and derived when the product, service, consumer & partner trends are studied and understood. 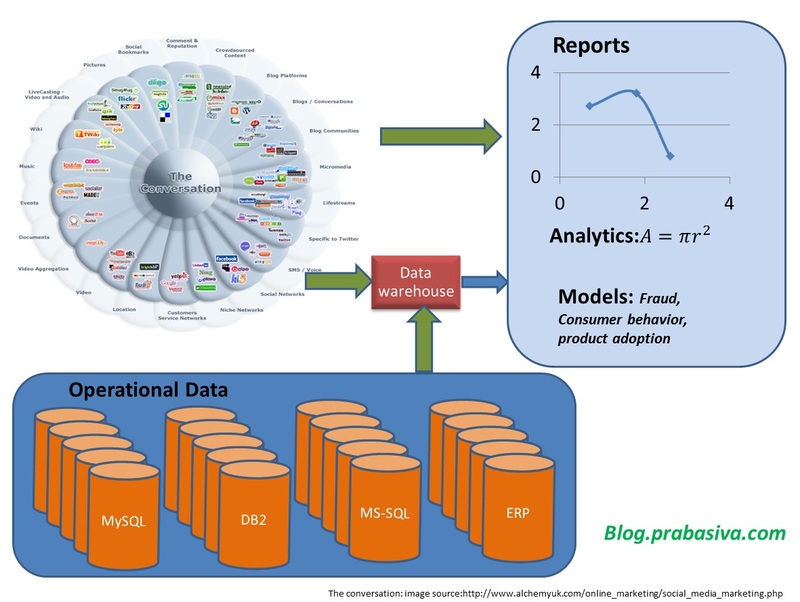 The consumer, partner, product and economical data is unstructured in uncharted territory. A massive data set in uncharted territory includes both internal, external structured and unstructured data. The massive data set is called big data. Why is it now? – A need arose for big data with emergence of social media and other unstructured data widely used both in ternally and externally in an organization. The unstructured data includes the customer status update in facebook, twitter, youtube video upload, picture upload from a smart phone and voice assistance like Siri. The behavior of consumer, end user actual experience, product acceptance & adoption are viral, unstructured and paradoxical. With rapid adoption and growth in mobile technology- the consumer interaction, purchasing habits, product reviews are done viral. Simplified approach for the consumer to engage in an experience increased the complexity of analysis from a service provider perspective. An unsatisfied customer does not call “1-800-sup-port” number any more to file a compliant. They tweet, or update in their facebook s tatus about their experience. The companies trying to measure the customer satisfication by analysing the internal customer compliant database sure will miss the reality. 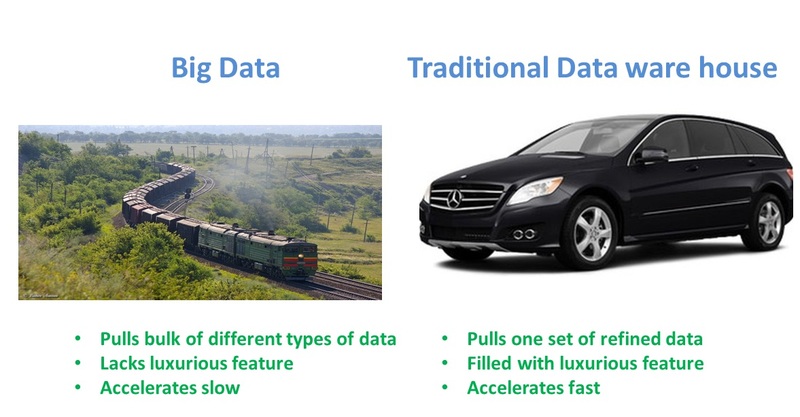 Traditional and trivial data analytics are not good enough anymore. Availability of technologies like Hadoop, HDFS, Avro, MapReduce, Zoo Keeper, Pig, Chukwa, Hive, HBase,R Programming make the big data concept practical. Emergence of massive unstructured data through social media , utilization of it for daily activities and availability of technologies led into the bigdata now. All of the core technologies for Bigdata are open source tools. With minimum hiccups during the Easter weekend, Hadoop, MapReduce was successfully installed, configured and functional in Ubuntu Linux runing on Virtual Box on the host OS Windows 7. There are lots of commercialized version and open source tool available to run an enterprise big data infrastructure. I will write a big data technology landscape as my next topic related to big data. Yesterday, I had a coffee talk with one of my external mentee (outside the organization) and he is joining a new employer next week as a data architect. He asked my advice. I started with a disclaimer; my views are not just for a data architect. I expect any architect who joins new organization to do the following. It can also be generalized as a mentoring advice for who joins new organization. The following were my spontaneous response to him. 1. Understand the core business of the organization. If it is a profit organization, understand, how the company is making money? Translate the business model into cash flow diagram in a highest level. Do not make assumption based on the generalized business practice or models. For instance, increasing the customer traffic may increase sales and profit in retail sector but it may not be the case for boutique luxury product or service offering organization. In the boutique luxury product or service organization, the focus may be to retain existing customer. Not to increase the customer base since the supply is very limited and unable to even meet current demand. 2. Understand the culture of the organization. Is the company culture is innovative, fast followers, conservative, aggressive risk takers, collaborative, bureaucratic, autocratic, open, hierarchical (control) and etc. 3. Do due-diligence, investigate, communicate, communicate and communicate with all the key stakeholders in the organization to accomplish 1 and 2. After the short 30 minutes meeting, while driving to work and rushing to take my 8.30 am call in my car, I was thinking the following. There are terminologies like canonical data model, Meta model, master data management, enterprise data flow, enterprise data bus, enterprise service bus, big data and etc in the realm of data architecture. Quite often, I hear from a passionate data architect about these terminologies in a way, I struggle to understand the tangible benefit. For instance, I hear the definition for enterprise data flow as, enterprise data flow is a structured method that record analyze summarize organize explain the key information which are illustrative to bottom line core business process with inbound outbound flow that indented for the understanding enrichment enhancement and education of key decision maker to make right business decision at the right time to improve overall objective of the business. I didn’t hear the above exact definition but I exaggerated a bit to make my point using Raju Hirani’s idea. Main goal of enterprise data flow is to show critical information to improve ultimate business purpose (like profit). I see architects engage in a prolonged discussion to define taxonomy, framework, methodology, process, tools, governance, stewardship, data quality, reference model and etc. All are great topics and leads into an intellectual discussion, but, sometimes, I noticed the discussion missed to address the ultimate purpose. It is easy to complicate a thing but it is damn hard to simplify it. My expectation from an architect, including data architect, is to work really hard to simplify the architectural work. I visualize a data architect as a money-ball architect. For those who have not seen the movie money-ball, the movie is about real life experience in a base-ball team Oakland Athletics where the coach hired Yale graduated economics student who was so passionate about the game and league. He studies the league rules, player profile and creates near optimal data model and analytics to run a successful professional baseball team in the league with lowest investment. Any successful data architects are money-ball architects. Money-ball architect follows the rule, break the rule, create a new rule and break it until money-ball is identified in the massive multi-dimensional data domain, model the money-ball sub-domain data, identify the key business differentiator from the sub-domain and use it to improve ultimate business purpose. Money-ball architect will start using canonical data model, Meta model, master data management, enterprise data flow, enterprise data bus, enterprise service bus, big data, taxonomy, framework, methodology, process, tools, governance, reference model (follow the rule). Identify the areas which are not directly contributing to identify the money-ball (break the rule) and drop those areas. Introduce a new concept which directly contributes more to identify the money ball (create new rules) and repeat it until the money ball is identified, modeled and used to improve ultimate business purpose. To become a successful data architect, create a path for yourself to become a money-ball architect for your organization. Analytics, simply defined, a discipline of analysis has been in use for centuries. I was invited to IT leadership symposium organized by secure24, a hosting provider vendor in Michigan, USA. The event was choreographed by Thornton A. May. It was attended by selective senior executive IT leadership team from various industries in the region. Event was kicked off with a great opening presentation by Mr. May. The presentation was basically a story telling on how IT industry evolved to add tangible business benefit with simplified historical and anthropology examples. I really enjoyed it. The second part (part II) of the event was panel discussion. The panel members provided very intriguing ideas, message and concept. I learnt few new things from the panel discussion. Third part of the event; each table was given a topic and asked to discuss about the topic and present it to everyone. My table got the topic: “Future of analytics” and I was nominated unanimously to represent our table. My contribution to the table topic was that the future will depend on the social media and social networks. Other’s contribution was mainly on geo-fencing and its role in the analytics. Since I was nominated to represent the table, I was structuring my thoughts on how to represent our views while listening to other table topics. Mr. May run out of time and our table was omitted and our views on the topic was not heard. I decided to display my structured thought in my blog. This is how I would have presented. 1. Successes of IT organization are measured by its capability and capacity to execute and innovate. 2. Most critical differentiating factor of a successful IT organization is not adapting the latest technology trends like: cloud computing, mobile computing, service oriented architecture, integrated identity management. Most critical differentiating factor of a successful IT organization; “right people at the right job”. People are the one who make things happen in an organization. I would like to augment my view to the above points; vision without a plan is a dream and plan without a vision is a run around. People are the one who make things happen, not technology. 3. Unleash the core and its dependencies – Understand what really matters and its dependencies. Imagine that if iPhone was launched 12 years ago. We would have connected to the apple store via dial-up (AOL) to down load angry bird. Data plan would have cost us $500 a month and connection speed would have frustated a lot. All other external factors would have made iPhone under PALM category. As far we know, when Grog in 5000BC used two sticks and rocks to graph the upward trend in sales of his new invention, the wheel, the concept “analytics” was born. Almost took seven thousand years to make a leap in this area. What did we learn from the history? Analytics played a significant role for a mega success like Romans, Henry Ford and others. Those who understand the deep meaning of analytics made everlasting impact. Current expectation is, let the system make decisions and receive confirmation from end user to execute the plan. Trust over the system and acceptance of system generated decision have been increasing. Adoption to this model is accelerating. Navigation system in the car is a prime example for the current state. People are the one who make things happen and in the most of the profit and non-profit organization, people are direct or indirect consumer of goods and service. It is extremely essential to understand people to define or approximate the future. How people view the world? People define the world based on what they see and hear. World is blue when they view through blue glass and it is red when they view through red glass. Deeper view: for decades, the world has been defined numerous times every day by each individual through the social network. Historically, the social network was through snail mail, family gathering, corporate functions, bars and other occasional events. With the advancement of the technologies like smart phones, global networks, wireless networks, software tools, the social networking happens instantaneously. We are defining, redefining our world based on the instantaneous connection through invisible cosmic social network fiber. It becomes an addiction because we wanted to know what is happening around the world we defined. So facebook is addictive. Advancement of wireless network, mobile platform, social media, and end user computing devices led to higher sophistication and at the same rate people’s mechanical monotonic life style has raised up by few notches. They don’t have interest or time to view the product or service’s sales offering when they don’t need or not in the mood. At the same, they want to make an instantaneous execution of a decision when a systematic analysis was already performed and a decision is presented with highest level of confidence. The future of analytics will be presenting decision to you and by click of a button (or slide of a screen) you can execute the decision. For example, based on the social interaction,system will identify a consumer interest and capacity and capability;skiing during January time frame, received hefty bonus during x-mas time and carry over vacation from the previous year should be taken before first quarter. System will be presented an offer; 5 day ski trip to the best place with lowest possible rate, with best possible quality. Once you confirm the acceptance of the recommendation/decision, everything will be taken care by the system. Once the consumer enter Denver for skiing, geo-fencing will kick in and based on the interest, pattern, spend behavior the most suitable offers applicable at Denver during that vacation time will be presented by consumer’s car while the consumer driving from Denver airport to Breckenridge ski resort. Lot happened since I wrote my last blog: Steve Job left Apple’s chief executive office; HP came up with radically different business strategy; Facebook is working on a search tool; Google launched Google+; Google bought Motorola Mobility; Google bought IBM’s patents for undisclosed amount; Future of Android after Google’s acquisition of Motorola Mobility appears to be questionable; Microsoft continues to prove its copycat marketing strategy with Mango; It is more than obvious that personal computers migrating to legacy typewriter category; Oracle has the money and may have the desire to buy HP; Scientist found a planet made of diamond; gold deposits in earth were carried by asteroids – keep eye on those asteroid to monitor the gold value in financial market and few other significant ones. For each one of these events, I wanted to write a blog but unfortunately after 24th hour of a day, clock is reset for the next day and cycle repeated. And today, due to the heavy rain in Michigan my pre-quarter final cricket game got cancelled and got free few minutes and hence this blog post. By watching the significant events in recent past, it is evident all the tech dinosaurs are roaming wild to avoid the next big tech asteroid. In current market, it is a big business puzzle to predict the predator and prey due to growth acceleration rate in terms of consumer adoption in the technology segment. Lots of companies were formed in a garage with a simple idea and some of them were successful by simplifying the original idea and became a giant, and soon, it is worth for billions. Most of the overnight multi-billion dollar companies do not manufacture goods; do not provide a tangible service and hence very vulnerable for next big simpler idea. Recent trends have been proving the 200 year old economics theory needs fundamental change. The economic value is not only measured by goods and services but by a geo-cosmic fiber created by invisible social network. Dominant player in the technology company map is rapidly changing and player who is of size of a continent soon becomes unnoticeable island and vice-versa. All recent activities in the technology segment are all about positioning to the uncharted journey of consumer trends. We wish we have a magic lens to preview the future but we don’t. We understand and agree no tool or process or person can predict the future precisely but people are capable of approximate or define it. How do we approximate the future? Keep in mind few concepts. Learn history and study current. Unleash the core and its dependencies. Using the above concepts, how do we approximate the future of disk storage market segment? It will become a 30-40 page research report to completely answer the question. So, the approach is to scratch the surface to provide an idea how to approximate the future with an example. There are few dominant players in the storage industry like NetApp, EMC, IBM, Hitachi and etc. Today the storage is based on longitudinal magnetic recording or perpendicular magnetic recording. The limitation of this recording methods are competing requirement of read, write and stability. The size of storage unit using this technology ranges from 130 gb – 1 tb in square inch. The next generation recording will be based on shingled magnetic recording, bit patterned recording or thermally-assisted recording or combination of bit patterned and thermally assisted and over comes the limitation in the current recording methods. The storage unit size will range from 2 – 10 tb in square inch. All the current, future magnetic and thermal recording is done by set of semiconductors. There are set of companies manufacture those semiconductors that are used in manufacturing the storage units. The trends of semiconductors are based on the advancement in the quantum physics and solid state physics. The trends of the solid state physics can be studied by research made in academia by monitoring the paper published in journals and forums (like carbon based semiconductors are emerging and future electronic devices like iPad will have almost zero mass and can be folded and kept inside a shirt pocket). Connect all the above to trends of associated technology (quantum computing), problems faced by end users, problem introduced by the associated new technology trends, and etc. Being exhaustive in each step stated above will approximate the future of the storage industry. All the current tech giants are performing the similar studies to define or approximate the future. They are defining their merger and acquisition strategy, corporate strategy, business strategy, collaborative strategy and competitive strategy. It has become more challenging due to fundamental change in economic valuation and hence the unreset in technology industry. Time only can answer the actual results of these strategies of technology giants. I wish I had more time to write less in this post.